A Contest & an Excuse to Buy One More House! Greenleaf Dollhouses has come up with a wonderful new kit for their annual Spring Fling contest! Isn't it great? I love how multi-purpose this kit is. Click here if you'd like to go to their site and see more views or even order one. It's laser cut and fits together beautifully so far. Last year I chickened out and did not enter the contest, but this year I challenged myself and took the plunge. I'm a nervous wreck! So silly of me, I guess, but there's time constraints (as I'm teaching full time, tutoring, finishing my masters and being a wife and mom!). Then there's people judging my work too. All very nerve racking but I'm choosing to have fun with it. Unfortunately, I have to keep the project a secret for now, but as soon as the contest is over, I'll go back and blog it all. Good luck to any of you who are entering the contest too. 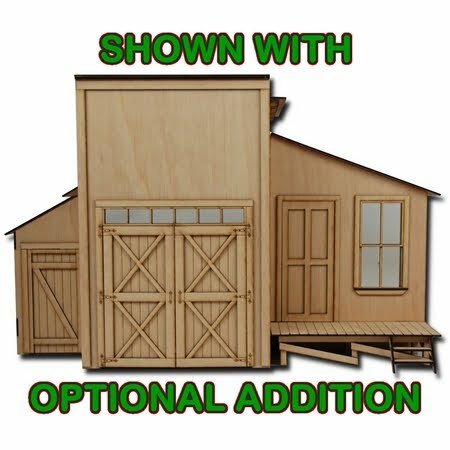 For those of you who are looking for an excuse to buy one more dollhouse or kit, here's one my husband came up with. My husband practically insisted that I order this kit even though I have 3 already that I'm still working on (one is just finishing details). His reasoning: The reason I don't completely finish my houses (which drives him nuts) is because I love the process more than the end product. Therefore if I have a new kit, I'm more likely to completely finish one of my old ones because I have a current project to work on. How's that for logic? Let me know if that excuse works for you!